This stunning, monumental jardiniere, strikingly veneered in malachite, has been designed with opulence and luxury in mind and makes a bold design statement. The extremely large jardiniere is a true 'statement piece', suitable for only the finest luxury residences and interiors. Its large size and striking colour scheme makes it suitable for use as a planter for the display of plants and flowers, but it could also be converted for use as a fountain or basin. 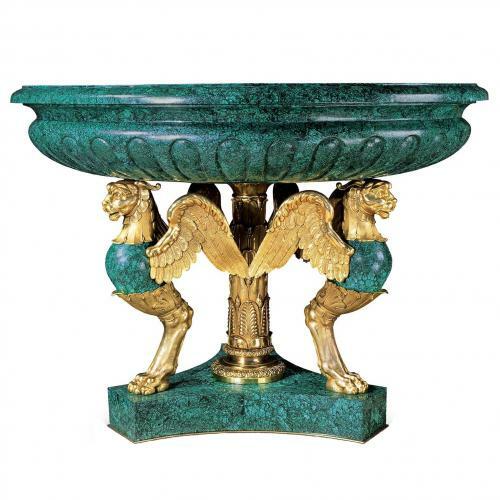 The jardiniere is finished in the cool green semi-precious gemstone malachite and mounted with beautifully-cast ormolu decorative features in the French Empire style. The piece consists of a wide, shallow bowl, supported by three ormolu winged lions - or sphinxes - below, each with one ormolu leg on a shaped tri-form malachite base. The detailing on the lions' wings is superb, as are the decorations on the central supporting column, which show leaves and foliage motifs in the Egyptian style. The Empire style refers to a design style popular in the early 19th Century, during the period of the French Napoleonic Empire. It, however, retained its popularity throughout the 19th and 20th Centuries, and was employed in the production of many fantastic, opulent pieces such as this.